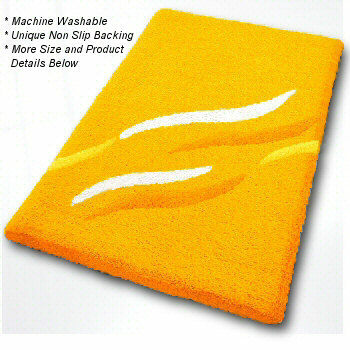 Beautiful luxury bathroom rug with subtle elegant pattern. Saffron:Golden orange tone. This mingled thread color rug has saffron orange and golden yellow as a base color with white, saffron and golden yellow accents. Coordinated Lid Cover: Solid Saffron. Kiwi Green: Beautiful two tone base color of kiwi green and bright green. The accent colors are white, kiwi and bright green. Coordinated Lid Cover: Solid Kiwi Green. Wine Red: Gorgeous deep dark red. The mingled two tone background is a dark wine red and ruby red combination with white, dark wine red and ruby red accents. Coordinated Lid Cover: Solid Wine Red. Taupe: Beautiful soft grey brown tone with medium tone brown, white and light brown accents.